It never fails. When I walk into a Department Store I become hyper alert. My eyes scanning the goods looking for that flash of stainless steel. Neck stretched trying to see above the displays for a sign that says Henckel. My head turning like an owl surveying the scene for that flash of crystal. I feel myself being drawn like a magnet to THAT department. No, not clothes, nor cosmetics, nor handbags and not even shoes, ( though shoes are a close second!). It’s, it’s, it’s HOUSEWARES! Sigh………my love. Dan laughs at me. I could spend hours and every dollar in my wallet in housewares. Oh, the call of heavy bottomed sauce pans. Gently pinging wine glasses just to hear them sing! Caressing porcelain plates painstakingly painted by hand. 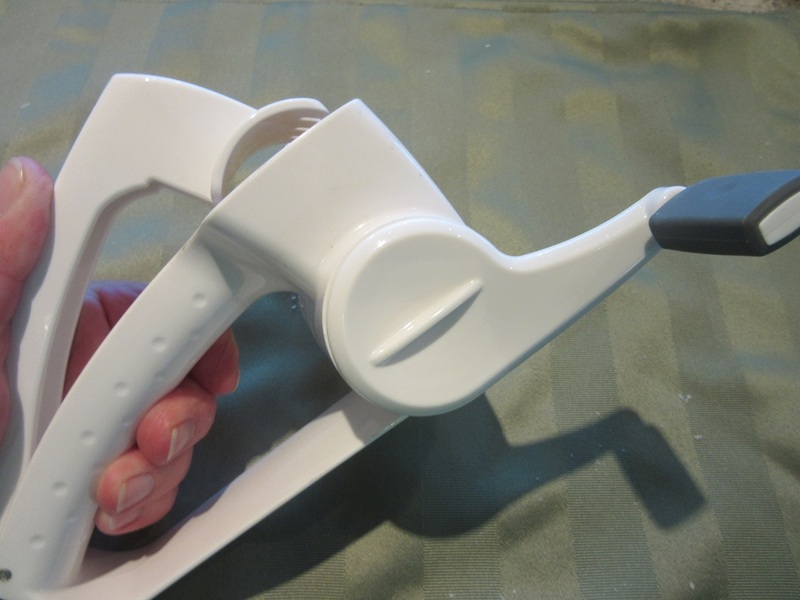 And then… then…then… there is the Kitchen Gadget section where I truly go over the edge! Whisks tiny enough for a Quail egg and huge enough for an Ostrich egg. Kitchen cooking timers shaped like vegetables and every color imaginable. Wine savers and stoppers. Measuring spoons in English and Metric. Mixing spoons from exotic wood to ceramic. Spatulas of steel, plastic, teflon and silicon! Graters and Microplanes. Measuring cups from one ounce to 3 liters. And it is all guaranteed to make my life simpler and better! I get dizzy from twirling around trying to take everything in and not miss something that oh..my..goodness, I do NOT have and can’t possibly imagine having lived without it all these years. Yes, I admit I do have a slight problem here but I really and truly do not want to get over my gadget addiction. I just plain old love them all. Enter the Cheese Grater. A few years ago, Sparky and I were shopping for “gourmet” ( pick your poison) items in a well known, very popular specialty foods and wine store in Kenmore, NY. They had just awesome cheeses and we bought a large cut of the real deal, Parmigiana Reggiano. Smiling happily with our purchase we wandered over to their Gadget department and then my heart stood still. I was dumbfounded staring at what was in front of me. How could I have possibly lived all these years and prepared countless Spaghetti dinners and not owned this genuine, hand held PLASTIC, made in China, work of art Cheese Grater! 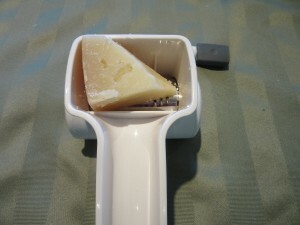 Right then, I knew I had to own one, before anyone knew that I was actually grating Parmesan cheese with a box grater. The shame of it all! 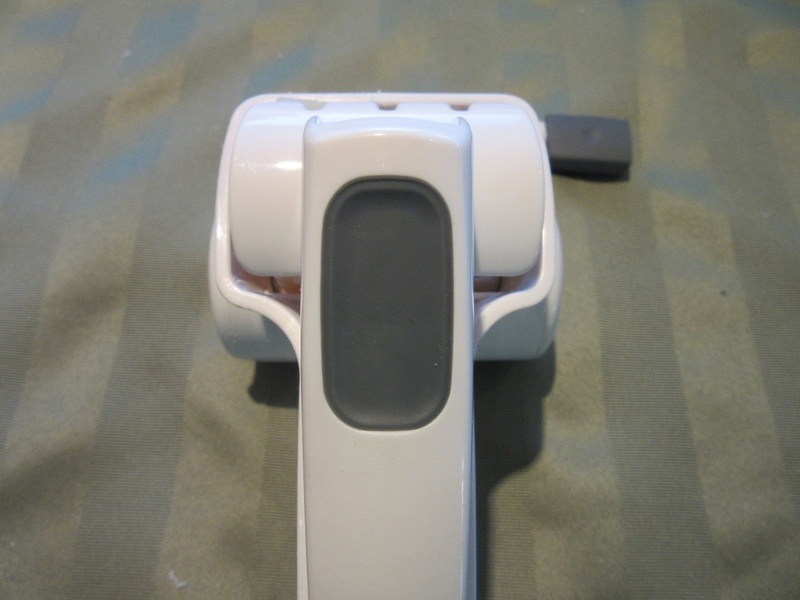 Yep…this little plastic gizmo is a favorite of mine. It has a squeezy type handle and a hand cranked arm. Its sole reason for being is to grate hard Italian cheese. Romano and Parmesano beware! Stick a chunk of cheese into the cheese holder compartment. Careful. It doesn’t hold much. Close the Squeezy handle thing and start cranking away. The beauty of it all is…it really works! 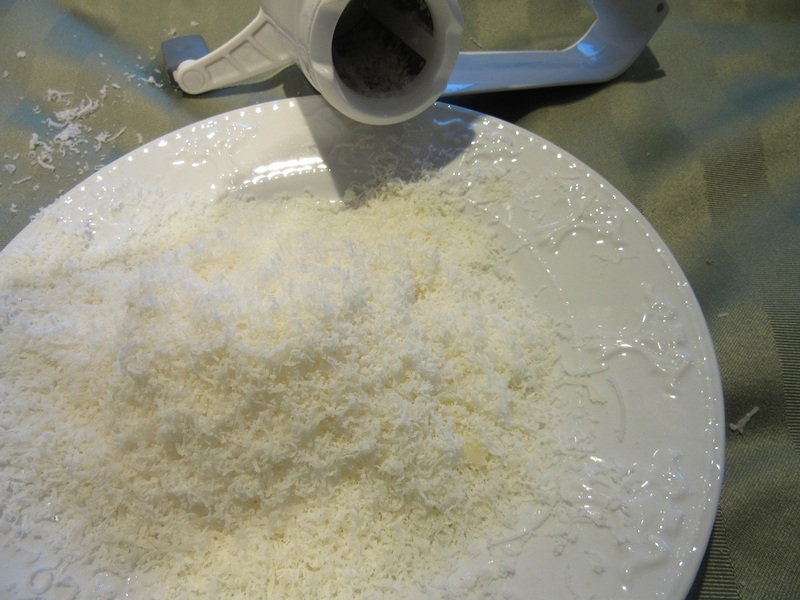 Nice, finely grated Parmesan cheese. 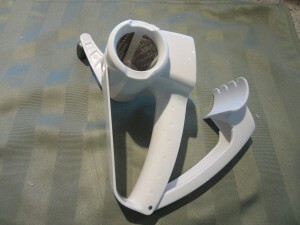 So, is it better than a box grater or a plane grater? Well, beauty is in the eye of the beholder. I like this little guy. He has his purpose in my kitchen, albeit a limited purpose. But essential? I’ll let you decide that one. Just wait ’til I tell you about my herb cutting scissors! Until next time, may your Journey be all you wish it to be. Yes Karen I also have a hand held cheese grater. My Sunday spaghetti dinners would not be the same without it. I grew up with one. Only that one was all metal which I could not find an all metal one. Enoy your grating and journey one.